You’ve seen Women of Faith before . . . but you’ve never experienced it like this! 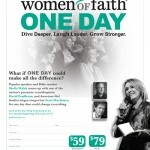 Women of Faith ONE DAY is a brand-new event unlike anything we’ve ever done before. New format, new focus, new depth . . .